The 15 amended federal land use plans the Interior Department's Bureau of Land Management adopted in cooperation with the Agriculture Department's Forest Service are among the rules and regulations now in effect that could be vulnerable under the Congressional Review Act of 1996, attorneys with the Pacific Legal Foundation told the Washington Free Beacon. The nonprofit, public interest law firm headquartered in Sacramento, California advocates on behalf of "private property rights, individual liberty, free enterprise, limited government, and a balanced approach to environmental protection." The firm embarked on a new initiative in February titled "Red Tape Rollback," which is devoted to educating lawmakers and the public about the Congressional Review Act (CRA) and its largely unexploited benefits. The legislation, which was enacted under House Speaker Newt Gingrich and signed into law by President Clinton in March 1996, calls for regulatory agencies to send rules to both houses of Congress and the Government Accountability Office. This must be done before the rule can go into effect. Congress then has the ability to schedule up-or-down votes with simple majorities on resolutions of disapproval for any rule the members want to disapprove using fast track procedures. During the first 60 legislative days after a rule is received, the CRA allows Congress to vote on those resolutions of disapproval to overturn rules without a Senate filibuster and with limits on the amount of time the Senate can take to debate. A member of the House and Senate each have to first introduce a joint resolution and the majority leader has to bring it to the floor. Both the House and the Senate versions would be subject to a simple majority vote if acted upon within the 60-day legislative window. Those resolutions that pass are sent to the president for his signature or veto. If the president signs, this means the rule is voided and any "substantially similar" rule cannot be adopted in the absence of a new law authorizing it. The Obama administration's land use amendments—which were implemented with the stated purpose of protecting a stout, ground-dwelling, chicken-type bird species known as the greater sage-grouse—are among the many Obama-era rules that the Trump administration could submit for congressional review, Todd Gaziano, an executive director for the Pacific Legal Foundation's Washington, D.C. Center, said in an interview. Since the Interior Department's Bureau of Land Management and the Agricultural Department's Forest Service failed to submit their "Records of Decision" on the land use plans for congressional review, they are not lawfully in effect and cannot be lawfully implemented, Gaziano said, adding that they are therefore vulnerable to resolutions of disapproval. The greater sage-grouse occupies about 170 million acres in 11 western states, according to the Bureau of Land Management. The land use plans impact 10 of those states: North Dakota, South Dakota, Wyoming, parts of California, Nevada, Oregon, Utah, Colorado, Montana and Idaho. Colorado is also home to the Gunnison sage-grouse, a close cousin of the greater sage-grouse, which Interior's U.S. Fish and Wildlife Service (USFWS) listed as "threatened" under the Endangered Species Act (ESA) in November 2014. Gov. John Hickenlooper filed suit against the Interior Department and USFWS a few months later to overturn the listing. Local government officials in Gunnison County have joined with Hickenlooper in this effort. The Democratic governor points to figures in his lawsuit that show the bird population has increased in response to local conservation efforts and should not be listed under the ESA. Environmental groups are calling on the USFWS to elevate the listing of the Gunnison sage-grouse from "threatened" to "endangered." WildEarth Guardians has partnered with Clait Braun, a retired sage-grouse researcher with the Colorado Division of Wildlife, in its Gunnison sage-grouse litigation while The Center for Biological Diversity and the Western Watersheds Project have joined in a separate suit calling for an endangerment listing. The Interior Department announced in September 2015, that the greater sage-grouse would not be listed under the ESA thanks to public-private partnerships that have boosted the bird's population. However, Gaziano suspects that agency bowed to political pressure from environmentalists, imposing the land use amendments in lieu of an ESA listing. "On the merits, the land use amendments are a good set of rules for Congress to express its will and as a citizen I hope that Congress disapproves of these rules because [U.S.] Fish and Wildlife properly found that the greater sage-grouse is not threatened or endangered," said Gaziano, who is also a senior fellow in constitutional law for the Pacific Legal Foundation. "In response to the anger over their correct scientific decision, which resulted in the lack of an ESA listing, BLM and Forest Service officials essentially did what would have been done under the ESA with the land use amendments." By striking down the Obama-era sage-grouse regulations, Congress would reaffirm constitutional principles and bolster local conservation efforts, said Jonathan Wood, a staff attorney with PLF. "The Constitution gives Congress, not federal agencies, authority to decide what to do with federal lands," he said. "We think there is no question the land use amendments are subject to the Congressional Review Act since they were not reported to Congress. This means they could be sent up to Congress and disallowed. This would send two positive signals. First, it would discourage the agencies from doing this again and second, it would embrace what states and private industry have done to preserve the sage-grouse without burdensome federal regulations." 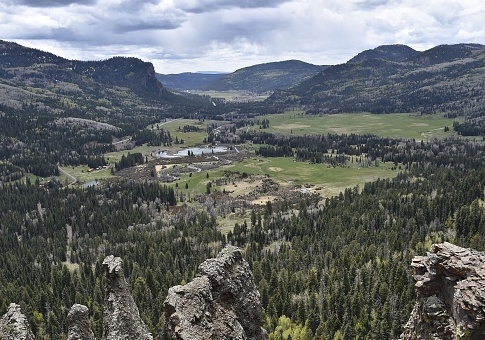 The land use amendments are in some ways more onerous and burdensome than an ESA listing said Brian Seasholes, a policy fellow with the Montana-based Property and Environment Research Center. With the ESA, it is at least possible to have a species delisted if the population figures improve. However, the land use amendments are on the books for an indefinite period of time without any measurable goal posts for success. "This coercive, heavy-handed, top-down approach to conservation does not work," he said. "The land that has the most ecological value is, for the most part, privately owned. But the federal plans only deal with federal land and they are operating under a narrative that says livestock is bad. If we are going to shove ranchers off federal land, that means they are going to graze private land more intensely and that could have an impact on the sage-grouse population." What happens next depends on the Trump administration. The Justice Department could attempt to reach a settlement between states and environmental groups suing the federal government, while the Interior and Agriculture departments work to revise the land use plans. Interior Secretary Ryan Zinke has been critical of BLM's "Washington Knows Best" approach to the greater sage-grouse and has said he favors state based solutions. Representatives with Zinke's Interior Department declined to comment for this story. Seasholes is keen on the idea of pressing ahead with the Congressional Review Act. When the Obama administration finalized its land use plans, local conservation plans had paid off in the form of a rising greater sage-grouse population that now exceeds 430,000, according to the most recent figures. This could point a path forward. "For conservation to work, it needs to be very localized and site specific," he said. "What works in central Nevada doesn't work in northern Utah. These federal plans take no account of the differences across geography. The Congressional Review Act offers a way out of these ill-conceived plans. There are significant restrictions that have been imposed on activity in western lands that were never submitted to Congress for review, which is what should have happened under the law." If land use amendments were permitted to stand without congressional review, it would set a terrible precedent, Gaziano said. "It's bad enough that the Endangered Species Act has been abused and used in ways that are not authorized by statute," he said. "But what has been done with the greater sage-grouse is to say that despite the fact that it is not threatened or endangered, the federal government can just come in and place controls on huge swaths of land without letting congress review these rules. If they can get away with it with the sage-grouse, they can get away with it almost any animal whether or not it is actually threatened or endangered." This entry was posted in Issues and tagged Department of the Interior, Grouse, Regulation, USDA. Bookmark the permalink.